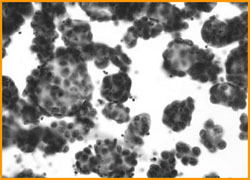 The microscopic appearance of ovarian serous carcinoma cells in ascites. Ovarian cancer at late stages tends to induce ascites (fluid in abdominal cavity) where cancer cells form clusters and expand. Ovarian cancer is the most lethal gynecologic malignancy (1,2). Although new chemotherapeutic agents have significantly improved the five-year survival rate, the overall mortality of ovarian cancer has remained unchanged (3). This is mainly because of a lack of success in diagnosing ovarian cancer at an early stage (nearly all patients with advanced stage of ovarian carcinoma die of the disease). On the other hand, 90% of those with the disease confined to the ovary survive. Despite considerable efforts directed at early detection, no cost-effective screening tests have been developed (4). Although pelvic and, more recently, vaginal sonography have been used to screen high-risk patients, both techniques lack sufficient sensitivity and specificity as screening tools for the general population. Thus, the search for tumor markers capable of early detection of ovarian carcinoma is of profound importance and represents one of the most urgent subjects in the study of ovarian cancer. The different types of ovarian cancers are not only histologically distinct but may exhibit different clinical behavior, tumorigenesis, and probably gene expression pattern (7). Based on prevalence and mortality, the serous carcinoma is the most important, representing nearly 40% of all primary ovarian carcinomas with an overall five-year survival rate of approximately 30%. Unless otherwise specified, serous carcinoma is what is generally thought of as "ovarian cancer." Accordingly, in this review we will confine our discussions largely to serous carcinoma. Ovarian cancer represents 25% of gynecologic cancers but accounts for 50% of the deaths from all gynecologic tumors. Approximately 23,000 women are diagnosed with ovarian cancer each year in the United States and 14,000 women die of this disease annually (8, 9). Epidemiologic and molecular-genetic studies have identified several risk and protective factors associated with the development of ovarian cancer (10). The most significant risk factor is a family history of the disease, and genetic alterations in BRCA1 and BRCA2 tumor suppressor genes that occur in the majority of hereditary ovarian cancer. This hereditary form of ovarian cancer represents only 5% to 10% of all ovarian cancer patients, and the vast majority of ovarian cancers are sporadic (9). For women in the United States, the overall lifetime risk of developing ovarian cancer is 1.4% to 1.8%, whereas the risk increases to 9.4% for women with a family history (10). Additional risk factors include nulliparity and refractory infertility. Protective factors include multiparity, oral contraceptives, tubal ligation, and hysterectomy. The development of improved strategies for the early detection of ovarian carcinoma depends on a better understanding of its pathogenesis-the morphological and molecular events in the development of ovarian cancer. Despite recent studies aimed at elucidating the molecular mechanisms of ovarian cancer, its pathogenesis is poorly understood (11). Several potential tumor suppressor genes have been identified: NOEY2, PTEN, and OVCA-1 and -2. Except for BRCA-1 and BRAC-2 in familial cases, little evidence has been reported suggesting that these genes are important in the pathogenesis of serous carcinomas (12-15). At present the most widely held view is that serous carcinoma arises directly from the transformation of the ovarian surface epithelium or its inclusion cysts through a "de novo" process (16,17). However, based on extensive studies of clinical, histopathological, and molecular genetic features of a large series of ovarian serous tumors, ovarian serous carcinoma may develop along different pathways (18,19). In this new model, ovarian serous carcinomas are stratified into two morphological categories: conventional serous carcinomas and invasive micropapillary serous carcinoma (MPSC) that develop along distinctive pathways. In the first pathway, the conventional type of serous carcinoma develops by direct transformation from ovarian surface epithelium or inclusion cysts to a high-grade neoplasm without recognizable intermediate stages (the "de novo" pathway). These tumors demonstrate wild-type KRAS and BRAF, frequent p53 mutations, and a high level of allelic imbalance even in early tumor development (20). The second is the "stepwise" pathway. The serous tumors develop from serous borderline tumor to a noninvasive micropapillary serous carcinoma, then to low-grade serous carcinoma (invasive micropapillary serous carcinoma). In contrast to conventional serous carcinoma, this process, which appears to develop in an indolent fashion, has clear-cut precursor lesions. These tumors exhibit frequent KRAS or BRAF mutations, rare p53 mutations, and then gradually acquire more genetic abnormalities during tumor progression. For example, loss of 5q is associated with malignant transformation and loss of 1p with the acquisition of invasive phenotypes. Clinically, conventional serous carcinomas represent approximately 65% of all serous carcinoma and present as high-grade, high-stage aggressive neoplasms, whereas micropapillary serous carcinomas represents 35% of serous neoplasms and generally pursue a protracted indolent course. 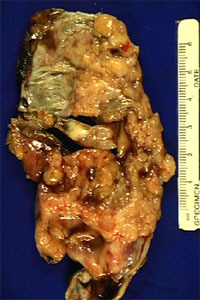 (tumor implant in omentum) Ovarian cancer usually presents with solid tumor involving the omentum at advanced stage. Most ovarian cancer patients do not present with specific clinical symptoms until their cancer has reached advanced stages (FIGO stage III or IV) (21). The strategies used to treat ovarian cancer are constantly evolving. Generally, surgical management represents the first-line treatment in all ovarian cancer patients (22,9). Following tumor resection or debulking surgery, the extent of disease involvement is determined (clinical staging) and combination chemotherapy using cisplatinum-based regimens is administrated to patients who have advanced-stage disease (9,23). These patients are followed by physical examination and imaging techniques, which are insensitive for detecting recurrence until tumors are quite advanced. In the past, second-look exploratory laparotomy was performed to evaluate the response to therapy; however, recently the benefit of this procedure has come into question because of its high morbidity and low sensitivity in detecting residual or recurrent carcinoma (9). Using a multi-modality approach to treatment, including aggressive cytoreductive surgery and combination chemotherapy, the five-year survival rates are 93% in stage I, 70% in stage II, 37% in stage III, and only 25% in stage IV (10). Development of tumor markers that can be clinically applied to screening, differential diagnosis, monitoring, and prognostic prediction of ovarian cancer is crucial to improving the clinical outcomes in patients who have this devastating disease. Ideally, these tumor markers should provide a high sensitivity and specificity to such purposes. Unfortunately, these criteria are rarely met for the current ovarian cancer makers. CA125 is the only marker that has been applied in the clinical setting for the follow-up of patients with ovarian cancer; however, the low sensitivity and specificity limit its use as a screening tool for early detection and differential diagnosis. Recent advances in biotechnology and the completion of human genome project have great impact in accelerating the discovery of novel tumor markers associated with ovarian cancer. These emerging markers are expected to hold great promise in improving early diagnosis and monitoring in patients with ovarian cancer. Banks E, Beral V, Reeves G. The epidemiology of epithelial ovarian cancer: a review. Int J Gynecol Cancer 1997;7:425-38. Parkin DM, Muir CS, Whelan SF. Cancer incidence in five continents. Lyon, France: IARC Scientific, 1992. Ozols RF, Rubin SC, Thomas GB, Robboy SJ. Epithelial ovarian cancer. In: Hoskins WJ, Perez CA, Young RC, (eds.). Principles and practice of gynecologic oncology. 3rd ed. Philadelphia: Lippincott, Williams, and Wilkins, 2000:981-1057. Paley PJ. Ovarian cancer screening: are we making any progress? Curr Opin Oncol 2001;13:399-402. Young RH, Clement PB, Scully RE. The ovary. In: Sternberg SS, (ed.). Diagnostic surgical pathology. 3rd ed. Philadelphia: Lippincott, Williams, & Wilkins, 1999:2307-2394. Scully RE. World health organization international histological classification of tumors. 2nd ed. New York, NY: Springer, 1999. Hough CD, Cho KR, Zonderman AB, Schwartz DR, Morin PJ. Coordinately up-regulated genes in ovarian cancer. Cancer Res 2001;61:3869-3876. Greenlee RT, Hill-Harmon MB, Murray T, Thun M. Cancer statistics, 2001. CA Cancer J Clin 2001;51:15-36. Memarzadeh S, Berek JS. Advances in the management of epithelial ovarian cancer. J Reprod Med 2001;46:621-9; discussion 29-30. Holschneider CH, Berek JS. Ovarian cancer: epidemiology, biology, and prognostic factors. Semin Surg Oncol 2000;19:3-10. Berek JS, Martinez-Maza O. Molecular and biologic factors in the pathogenesis of ovarian cancer. J Reprod Med 1994;39:241-248. Yu Y, Xu F, Peng H, Fang X, Zhao S, Li Y, et al. NOEY2 (ARHI), an imprinted putative tumor suppressor gene in ovarian and breast carcinomas. Proc Natl Acad Sci U S A 1999;96:214-219. Obata K, Morland SJ, Watson RH, Hitchcock A, Chenevix-Trench G, Thomas EJ, et al. Frequent PTEN/MMAC mutations in endometrioid but not serous or mucinous epithelial ovarian tumors. Cancer Res 1998;58:2095-2097. Schultz DC, Vanderveer L, Berman DB, Hamilton TC, Wong AJ, Godwin AK. Identification of two candidate tumor suppressor genes on chromosome 17p13.3. Cancer Res 1996;56:1997-2002. Phillips NJ, Zeigler MR, Deaven LL. A cDNA from the ovarian cancer critical region of deletion on chromosome 17p13.3. Cancer Lett 1996;102:85-90. Bell DA, Scully RE. 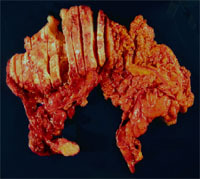 Early de novo ovarian carcinoma. A study of fourteen cases. Cancer 1994;73:1859-1864. Auersperg N, Edelson MI, Mok SC, Johnson SW, Hamilton TC. The biology of ovarian cancer. Semin Oncol 1998;25:281-304. Seidman JD, Kurman RJ. Subclassification of serous borderline tumors of the ovary into benign and malignant types. A clinicopathologic study of 65 advanced stage cases. Am J Surg Pathol 1996;20:1331-1345. Katabuchi H, Tashiro H, Cho KR, Kurman RJ, Hedrick Ellenson L. Micropapillary serous carcinoma of the ovary: an immunohistochemical and mutational analysis of p53. Int J Gynecol Pathol 1998;17:54-60. Singer G, Kurman RJ, Chang H-W, Cho S, Shih I-M. Diverse tumorigenic pathways in ovarian serous carcinoma. Am J Pathol 2002 (in press). Eltabbakh GH, Yadev PR, Morgan A. Clinical picture of women with early stage ovarian cancer. Gynecol Oncol 1999;75:476-479. Stratton JF, Tidy JA, Paterson ME. The surgical management of ovarian cancer. Cancer Treat Rev 2001;27:111-118. Christian J, Thomas H. Ovarian cancer chemotherapy. Cancer Treat Rev 2001;27:99-109.